Kristen McAllister, a reporter who covers personal finance for the Dayton Daily News, hosts this week’s edition of Cavalcade of Risk at her blog, Making Cents. Check it out! As the summer draws to a close, it’s a good time to step back and take the long view. In this case, the view goes all the way back to 1200 AD. My daughter’s high school summer reading included an intriguing book entitled: Genghis Khan and the Making of the Modern World, by Jack Weatherford. The great Khan’s name probably does not come to mind when you think of the world’s management innovators. Indeed, most of us think of the “Mongol Hordes” as a scourge of civilization, a brutal and merciless force that arose in the far deserts of China and swept westward in a destructive path. There’s some truth to that image, but a huge dose of western-centric prejudice as well. Weatherford has set out to revise the historical perspective on Khan. He sees him as a great innovator, a master strategist and a brilliant manager. As the first person to unite the Mongol tribes, Khan created the largest and last of the great nomadic powers, conquering all the way from India to the gates of the west. Reward merit: Khan moved away from hereditary privilege by promoting his most talented followers. As a result, his organization benefitted from the best talent, not just Khan’s relatives. Discipline is key: demand self-control and discipline from every warrier and every leader. He abolished the long-established practice of stealing wives, which fragmented the tribes into warring camps. After a conquest, the spoils were carefully inventoried and then divided for the benefit of all. Organize, Organize, Organize: Contrary to the “mongol horde” image, Khan developed a meticulous system for organizing his army. Using a sequence of tens, his basic unit was a squad of 10 warriers, united in a company of 10 squads, eventually reaching an army of multiple thousands. Every camp had the same physical lay out, so messengers could move from camp to camp and find the leadership without the delay of having to ask directions. Turn your opponents strengths into a weakness, part one: confronted with great walled cities, Khan built a higher wall of logs around the outer wall of the city, so his men could look down into the city and strike fear in the hearts of its people. Turn your opponents strengths into a weakness, part two: Khan would have his armies flee in mock terror of armed knights. The knights, in all their splendid (and cumbersome) gear, would pursue his army to the point of exhaustion. Khan’s disciplined warriers then swung back and easily obliterated the bewildered knights. Khan’s destruction of the princes of Russia was a blow from which that country never recovered. Use psychology and trickery: Khan’s amassed troops might prepare for battle with an eerie silence, spooking their opponents. Khan’s troops would light multiple fires, so they appeared to have more troops than they actually did. Using selective violence, Khan struck terror into the hearts of his opponents, while offering all but the leaders an opportunity to join his ranks. Be fast: Khan never used an infantry. All his warriers were on horseback and all carried or acquired their own provisions as they rode. They didn’t need a long baggage train. They crossed the desert in winter, to minimize the need for water. They tightly wrapped their bodies in scarves to keep internal organs from bouncing around during their 60 mile a day rides. His warriers wore leather, not metal armor, so they were much more mobile than their western counterparts. Embrace new technologies. Khan invited his captives to join him. In this manner, he brought in skilled masons, architects, engineers and writers whom he encountered in both the far east and the west. To be sure, Khan’s own legendary brutality severely limits his utility as a role model for contemporary managers. He was fond of rolling his opponents into carpets and stashing them beneath his tent floor, where they starved to death. He was known to use catapults to hurl men, women and children over the walls of a beseiged city. He rounded up peasants from the countryside, pushing them ahead of his troops to absorb the first blows of his opponents and to fill up the moats in front of walled cities. Upon capturing a city, he immediately slew all the leaders and all of the wealthy. Admittedly, this is not exactly an “I’m OK, You’re OK” approach to leadership. (Then again, it might remind some people of “Chainsaw” Al Dunlop, the legendary CEO of Sunbeam Corp.) In any event, Genghis Khan cast a long, long shadow in history, so in the waning days of summer, we thought it was worth a few moments to reflect on some of the innovations he brought to the ever-evolving menu of management tools. I applaud those who work to develop the field of evidence based medicine, but I caution them to not over sell the promise of EBM. EBM represents another tool in medicine. We should pay attention to the findings, and then apply them to our patients. But we must always apply these, and any other tools in the context of the patient. If we try to overemphasize the science without considering the art, then we are failing our patients. Medicine – From Business Week, ten devices that are changing medicine. Safety cheats – The Naval Safety Center’s Photo of the Week is a real pip this week. (via rawblogXport). Hiring – George’s Employment Blawg has some good tips and resources on how to conduct meaningful reference checks. 9/11 Rescue Workers – Troy Rosasco of Disabled Worker Law Blog has an excellent rundown on the 9/11 Rescue and First Responders Workers’ Compensation bill that was recently signed into law in New York. Better late than never – too bad some rescue workers had to face their last few days without adequate health coverage to make this happen. Airport ground crews – Jordan Barab points to a recent article in the Washington Post discussing the hazards faced by airport ground crews. To make matters worse, these workers often fall in a regulatory grey zone – some tasks governed by OSHA while others fall under the FAA. Pandemic prep – Tom Trocee of Actuarial News asks if we are prepared for a pandemic, and offers a wealth of links and resources to help. Wacky insurance excuses – the British firm Norwich Union put out a list of the strange excuses related to insurance claims. Sample: ‘I couldn’t brake because a potato was lodged under the pedal.’ OK, while not necessarily occupationally related, we insurance geeks have to take our humor where we can find it. Thanks to actuary.net for the pointer. Jared M. Rhoads hosts a fine edition of Health Wonk Review at the Lucidicus Project. He calls this compilation “Selected Writings on Capitalism in Medicine.” If you are interested in the goings-on in the world of health care, it’s definitely worth a look-see. Back in 1925, legislators in Arizona wrote the first workers compensation statute for that state. It’s safe to say they had no idea that the absence of a single comma would send lawyers scrambling for clarification some 80 years later. The story involves workers comp coverage for illegal immigrants. “Mario Lopez” hurt his back moving furniture in 2001. He filed a claim for permanent disability benefits, which was denied based upon the lack of medical evidence. He appealed. It turns out that “Lopez” was really Jose Luis Gamez, an illegal immigrant. The court of appeals upheld the lower court’s ruling, but in doing so, one of the three judges, Daniel Barker, filed a “special concurring opinion” that went much farther than the original denial. Barker, carefully parsing the original statute, concluded that the law did not include coverage for illegal immigrants. Here’s the original wording of the statute: employees eligible for benefits include “aliens and minors legally or illegally permitted to work for hire.” According to Judge Barker, the phrase “legally or illegally permitted to work for hire” refers only to minors. He believes that applying the phrase to “aliens” goes beyond the syntax and meaning of the statute. While not binding, his statements could lead others to deny benefits to undocumented immigrants solely on the basis of their being here illegally. Put a comma after “minors” and the problem goes away. Without the comma, the dependent clause “legally or illegally” might well be construed to apply only to minors. Even though Judge Barker’s “special concurrence” is not binding on lower courts, it surely muddies the waters. As a result, the state’s leading workers’ compensation insurer is asking the Arizona Supreme Court to settle whether illegal immigrants are eligible for comp benefits. The state fund wants the Supreme Court either to erase Barker’s concurrence or issue its own ruling on the issue. The fund, along with the state Industrial Commission and an association of lawyers who represent injured workers, all argue that current state law protects illegal immigrants. They point to the fact that a recent bill to deny benefits to illegal immigrants was defeated in the state legislature. After three quarters of a century, the fate of hundreds, even thousands of workers hangs on a simple comma. Judge Barker’s reading of the statute opens the proverbial can of worms, presumably with a comma-shaped opener. Let’s hope the Arizona Supreme Court puts the lid back on the can, where it belongs. The Bureau of Labor Statistics has issued its report on workplace fatalities for 2005. The total number of deaths (5,702) is down a fraction from the previous year’s 5,764. In his press release announcing the results, Assistant Secretary of Labor Edwin Foulke tries to emphasize the positive, which isn’t easy, given the inherently morbid nature of the data. Fatal falls declined 7 percent last year from an all-time high recorded just a year earlier [Wow, did I miss the 2005 OSHA initiative to reduce the death rate from falls?]. Further, fatal work injuries among roofers dropped sharply, by 44 percent, [Gosh, Mr. Secretary, why are roofers suddenly being a lot more careful?] and, fatalities among women in 2005 (402) were the lowest annual total ever recorded by the census [excuse me, but this year’s report does not show any historical data on workplace deaths for women. It would be nice to know how many fewer women died in 2005 than in previous years]. While the number of fatalities among Hispanic employees edged up slightly last year due to increased employment of Hispanic workers, the actual fatality rate declined [why are more Hispanics dying?Is the increasing number of fatalities acceptable?]. – If you’re going to die at work, it’s still most likely to happen on the highway. – In construction, falls kill more people than anything else. Laborers die at higher rates than workers in the other trades. – Men comprise 54% of the workplace and 93% of the fatalities. – Women have a higher rate of death in two areas: on the highway and as the victims of homicide. – Despite the secretary’s reassurances, 917 Hispanics and Latinos died at work in 2005. That’s 16 per cent of the fatalities for a group that comprises about 13 per cent of the workforce. – The most dangerous occupations are fishing, logging and airline pilots – the high fatality rates a combination of high danger and relatively low total numbers in the workforce. – Among more common occupations, drivers/sales/trucking is the most dangerous, followed by agricultural workers and construction laborers. The annual data on dying at work does not contain much in the way of positive news. Every year, too many people die on the job. Virtually all of these fatalities are preventable. While we can debate what specific programs are most effective in decreasing the risk of injury and death in the workplace, it’s safe to say that this administration has reduced government’s role to the bare mimimum. No amount of data spinning is going to change that. Blog carnivals – catch up on news from the blogosphere. Stop by My Money Forest, which features this week’s edition of Cavalcade of Risk. Also, we are bit tardy in pointing out last week’s edition of Health Wonk Review, hosted by The Health Care Blog. Workplace fatalities – Jordan Barab of Confined Space brings us the good news and the bad news about the 2005 Census of Fatal Occupational Injuries. Here’s a related story from Occupational Hazards, courtesy of our friends at rawblogXport. New HR weblog – we welcome our friends at ESI Employee Assistance Group to the blog world with HR Web Cafe. We liked the post on the five key competencies that a manager needs to develop high emotional intelligence quotient. Language barriers – we’ve talked about health and safety issues related to the multilingual work force on several occasions. HealthLawProfBlog points us to a recent article in the New England Journal of Medicine on Language Barriers to Healthcare. Psychiatric disability – attorney Alan S. Pierce’s Workers Comp Matters most recent segment on The Legal Talk Network discusses psychiatric disability with attorney Bernard Mulholland, a legal expert in the field of workers comp and psychiatric disability. Market trending – Joe Paduda tells us that the property and casualty industry is looking good, for now, but advises you might want to keep your eye on the weather channel. Certificates of insurance – Specialty Insurance Blog cites a recent legal in discussing certificates of insurance, and why the issuance of such certificates alone may not confer coverage. Employer fraud: a $30 billion price tag? When the talk turns to workers comp fraud, the default assumption is that the employee is the culprit. In reality, employer fraud is a huge problem, of a scope that many in the industry would say dwarfs claimant fraud. According to Loretta Worters of the Insurance Information Institute in a recent article in the San Antonio Business Journal, premium fraud may cost the insurance industry as much as $30 billion a year. Workers’ compensation rates … are based primarily on three areas: 1) the amount of payroll; 2) the degree of risk — construction work is riskier than secretarial work; and 3) the claims experience of the company. After the recent electrocution death of a worker in Florida, the owner of the landscaping company is facing felony charges for failure to carry workers comp. If he is found guilty, penalties could include up to 30 years in prison and a $10,000 fine. California’s State Compensation Insurance Fund has received $566,480 in restitution from a roofing company owner convicted of workers’ compensation fraud for three felony charges: worker’s compensation insurance premium fraud; furnishing a false payroll deduction statement and filing a false tax return. In New York, three employers faced charges and restitution for defrauding the New York Workers Compensation Fund. The wrongdoing included forging an insurance certificate, submitting a false application, and making false statements. Workers compensation is compulsory insurance in every state but Texas. With some few exceptions, all employers are mandated by law to carry workers compensation insurance. Employers commit fraud when they fail to secure or maintain workers compensation coverage for their employees, or try to reduce their obligations by intentionally misclassifying employees or under reporting payroll. Fraud schemes hurt us all. First and most importantly, injured workers are often left without recourse or forced to bring suit to pay for medical care. Honest employers also pay for the misdeeds of fraudulent employers through higher premiums as insurer costs “trickle down.” In some industries, such as general contracting, honest employers may also suffer a competitive disadvantage since fraud perpetrators have a lower cost of doing business and can offer lower prices in competitive or bidding situations. Employer fraud often surfaces after an injury occurs when investigations reveal that an employer lacks coverage entirely or lacks coverage for a portion of the work force, such as workers wrongly categorized as independent contractors. One infamous case of this nature involved the owners of the Station nightclub in Rhode Island who faced a million dollar fine for failure to carry workers compensation insurance. This failure was revealed when the families of four deceased employees were left without benefits. Certain industries – such as businesses that employ a high number of contract, temporary, or seasonal workers – are rife with potential for fraud. In Florida last year, a sweep of construction sites resulted in more than 90 stop work orders. Some potential fraud indicators that companies may be trying to avoid regulatory compliance include businesses that pay people in cash or that have complex organizational structures and multiple business names. For a more comprehensive list of potential indicators, see Ohio’s list of red flags for workers compensation. If you suspect that your employer doesn’t have workers comp coverage, what can you do? Most states have mandatory posting requirements so you can look on bulletin boards to see if these and other employee right-to-know postings and licenses are current. In many states, employees or job candidates can check on whether an employer is insured by calling the state workers compensation authority. Many states also have fraud hot lines where workers can anonymously report suspected fraud. A Google search of workers compensation fraud hot lines turns up many numbers, or you can check with your specific state insurance bureau. Posted in Business, Insurance & Insurers, Misc. | Comments Off on Employer fraud: a $30 billion price tag? Every now and again, a textbook case of blatant workers’ comp claimant fraud surfaces in the media. In today’s example, we are presented with Robert and Rosemary Bunch, a California husband and wife tag team, who had received more than $1 million in direct payments, as well as the services of a housekeeper and a chauffeur (!) before state authorities caught up with them. Rosemary had been on permanent disability since 1995, and Ralph was on temporary total disability since 1999. The devious couple were experts in brazenly milking the system. Rosemary had been awarded the services of a full-time housekeeper due to the supposed severity of her disability, as well as the services of a chauffeured limo. This happy little arrangement came to a crashing halt when both parties were videotaped in activities which were totally inconsistent with their purported disabilities. In Roberta’s case, she even had the help of her limo driver, who obligingly carried her crutches right up to the courthouse door, where she strapped them on. This helpful fellow is also paying a fine for his complicity in the fraud. In a settlement, both have been put on probation and fined tens of thousands of dollars. In addition, most of their personal property, including a house, has been confiscated by the state for penalties and restitution. We’re all for throwing the book at these and other fraudsters – they hurt us all. And not the least of those harmed are all the workers who will be subject to increased mistrust and scrutiny because some employers who read this story will have misguided notions reinforced. We particularly hate to hear about cases like this because it reinforces the notion that claimant fraud is pervasive. Many employers and industry insiders think that fraud may be as high as 25 to 30%. We disagree. Some people are indeed larcenous. Most people aren’t. Employers who build their entire workers comp program on a foundation of fear of fraud are likely to create more problems than they solve. We ascribe to the “people live up to your expectations” school of management. If you build a program to trap the larcenous few, you will have a punitive system that imposes a toxic pall of suspicion over all. Suspicion and mistrust breeds more suspicion and more mistrust. Your strongest asset in managing your work force is mutual good will and mutual respect. We think the best prescription for fraud is preemptive. Be a great employer. Treat your employees fairly and consistently. Set expectations about preventing injuries, but also discuss what will happen should an injury occur. Explain to your employees what workers comp is, and delineate their rights and responsibilities should an injury occur. As part of that communication, let all employees know that you will have zero tolerance for fraud, and inform them of any criminal statutes in your state. Work diligently to having a zero-injury workplace, but if an injury does occur, analyze the heck out of it to ensure any necessary remedial actions occur so that no future injuries will happen. If a worker is injured, treat them fairly, help them get well and back to the job, and keep the lines of communication flowing during the recovery. Help resolve any temporary situational barriers that hinder return to work. Don’t be blind to the potential for fraud – there are many warning signs that should trigger a closer look. If you suspect fraud, be sure to document things and share your concerns with your insurer or third party administrator. Most state insurance authorities also have fraud investigative resources. We advocate a hard line on fraud, but it’s been our experience that good management can ensure that fraud is the rare exception. Coming up next: in our next post, we’ll turn the tables and talk about employer fraud. Heat illness prevention – The State Compensation Insurance Fund (SCIF) in California is offering a series of free Heat Illness Prevention seminars at various locations throughout the state. For those who don’t live and work in California, see the helpful page of tips and resources that SCIF compiled: Heat Illness in the Workplace: How You Can Control the Risk. Stalking as an occupational risk – The July issue of Psychiatric Times features an article about stalking as an occupational hazard for mental health professionals. This is an often overlooked risk that carries a high frequency of associated violence. Organizations employing mental health workers should provide educational programs designed to raise employee awareness about the risk. This article offers strategies to reduce the chance of being harassed or stalked by a patient or ex-patient, as well as suggestions to address such behaviors should they occur. Identity theft – the national trend towards missing or stolen personal data has now migrated to at least one workers comp insurer … personal info for 72 workers comp claimants was stolen from Sentry Insurance and then sold online. The thief, who was described as “a lead programmer/consultant from a nationally recognized computer contractor hired by the insurance firm,” has been apprehended. BP explosion as a harbinger – Jordan Barab at Confined Space suggests that the fatal Texas explosion at a BP refinery presaged some of the problems we are seeing today that shut down the pipeline in Alaska. He suggests that the incident that resulted in the death of 15 workers ” … revealed to the world BP’s systemic negligence of basic precautions needed to protect workers, the community and the environment.” This makes sense. 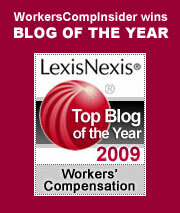 In our experience, a serious workers comp problem is often indicative of many other organizational problems. Prescription drug costs – Joe Paduda at Managed Care Matters tells us that prescription drugs now account for one-eighth of the medical spend in workers comp. He notes that employers that institute comprehensive control strategies are holding increases to the 2 to 5% range, while less savvy employers are experiencing annual increases of 15% or higher. Bid rigging settlement – Bob Sargent at Specialty Insurance Blog discusses the recent St. Paul Travelers’ settlement.